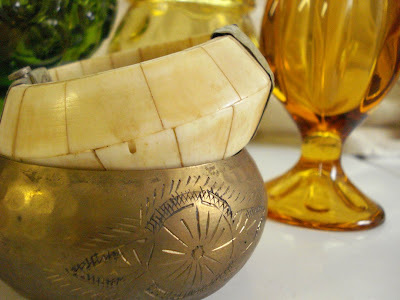 An old Ivory bracelet that was given to me years ago, that I know is bad to have, but I can't bear to part with it and a somewhat battered brass one someone made for me. I have ivory beads, too. Bad bad bad! Lovely photo, btw! You have a great eye for composition.